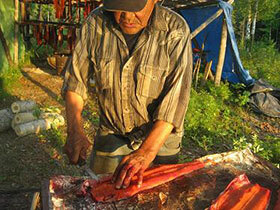 Resident of Nikolai cuts Kuskokwim caught fish before hanging and drying. Intermittently, projects that document the customary and traditional use of fisheries resources are conducted in Kuskokwim River communities by the Division of Subsistence. Community subsistence harvest surveys conducted by Subsistence Division with the approval of and in partnership with Village Councils\local governments’ document harvest amounts and information about the availability and abundance of resources. Local and Traditional Knowledge (LTK) research records what local people have observed and know about all aspects of the resources based on knowledge shared from one generation to the next. This research is reported in Division of Subsistence Technical Papers and helps resource managers make informed decisions. Data on the harvest of salmon for subsistence uses are collected annually. The Division of Commercial Fisheries began conducting postseason subsistence salmon harvest surveys in the Kuskokwim River drainage in 1960. In 1988 the Division of Subsistence began collecting and analyzing the annual subsistence salmon harvest surveys. However, in 2008 the Division of Commercial Fisheries once again assumed responsibility for this research. Fishing households have also utilized subsistence salmon harvest calendars and return mail post cards as a means of reporting their annual harvests. Non-salmon subsistence harvest estimates have also been obtained through community-based surveys conducted by the Division of Subsistence.